What a great family home! History and modern conveniences for all. Lovely view of the back yard and the screened in, wraparound porch. Welcome to Eisenhower's Retreat. Walk up these stairs from the parking lot and into history! Come into the screened in wraparound porch from the side of the house. 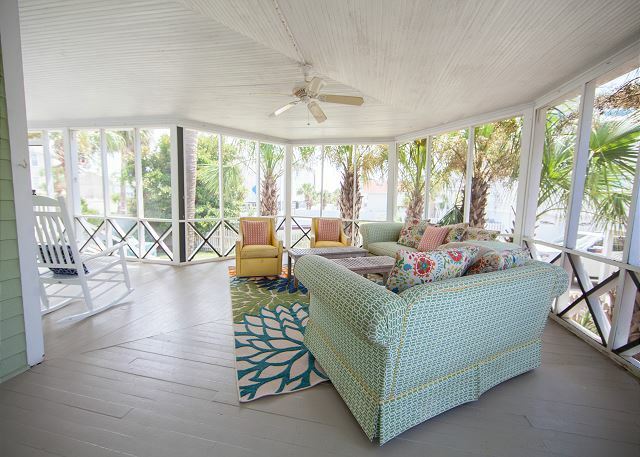 A screened in Southern porch is very much like another room. You'll find yourself living out here, rocking the day away in the ocean breezes, much as people have for the last 121 years! Cozy seating in our screened in porch. Modern Southern style. 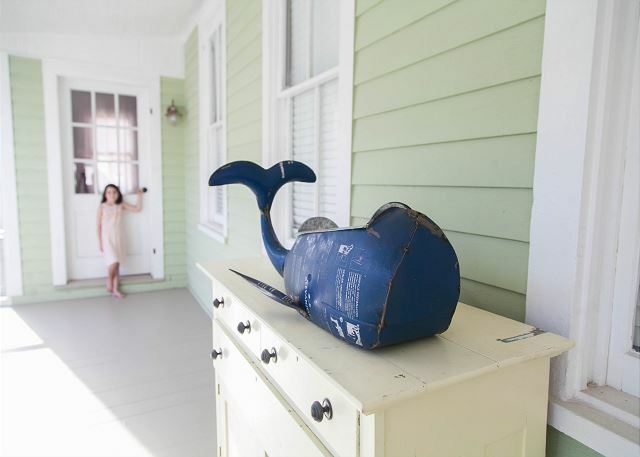 Whale look who's staying at Eisenhower's! Look at this beautiful outdoor seating! It's a whole other room just waiting for you to enjoy. Screened in as well. This outdoor screened in porch brings modern to a truly amazing vintage home. Sit here and feel the breezes?? Yes, please! 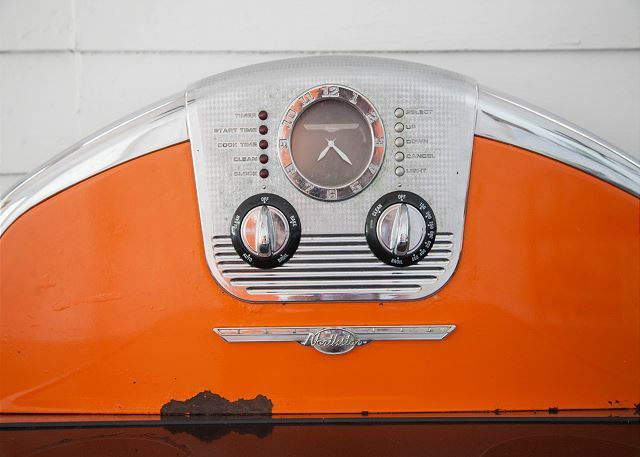 Amazing modern appliances with that vintage glow. 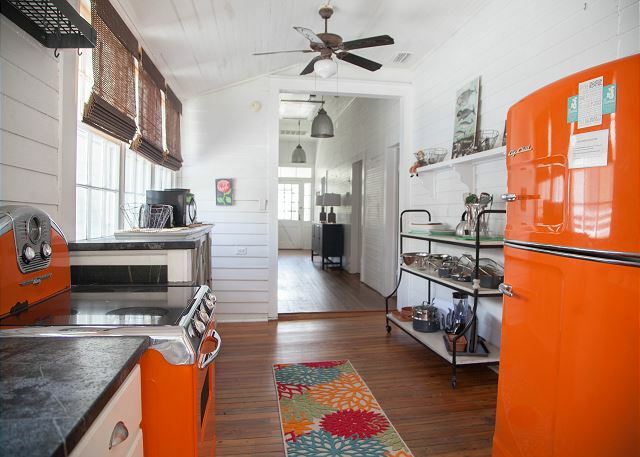 When you walk into Eisenhower's Retreat, you'll come right into the kitchen with these amazing 'vintage' look appliances. 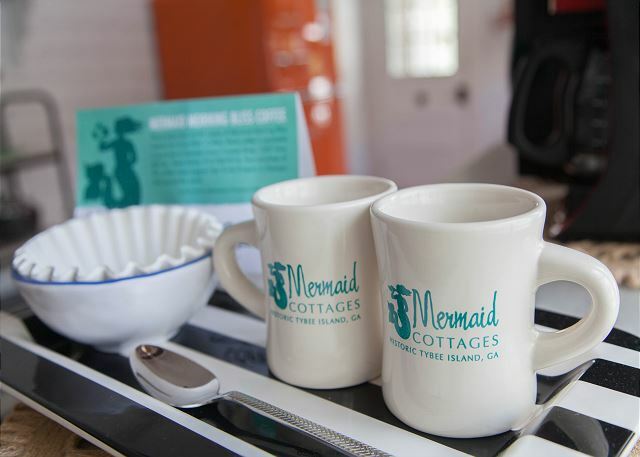 Mermaid Morning Bliss (MMM Bliss) for your first 'wakeup' on Tybee! Proceeds go to help sea turtles locally and globally (think globally, act locally) and you can buy more at local Seaside Sisters! Cook here? Yes please. 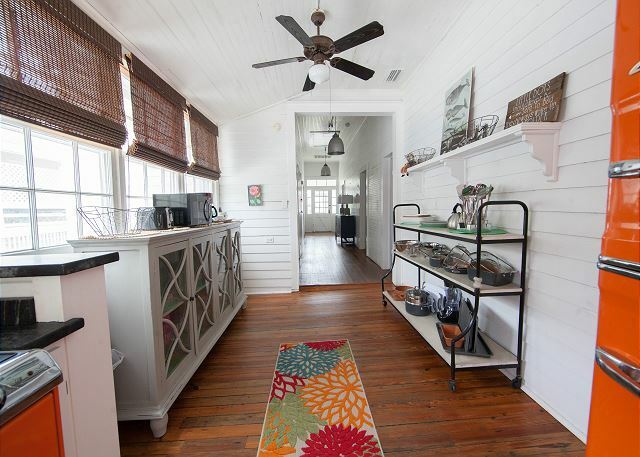 Open doors on both ends of the hallway to catch an amazing ocean breeze. You can have your own "Big Chill" moment! 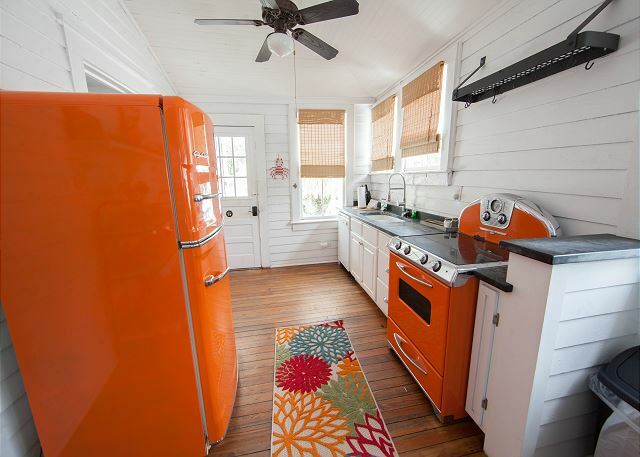 You'll enjoy the retro feel in this gorgeous sunset orange stove! Lovely kitchen. 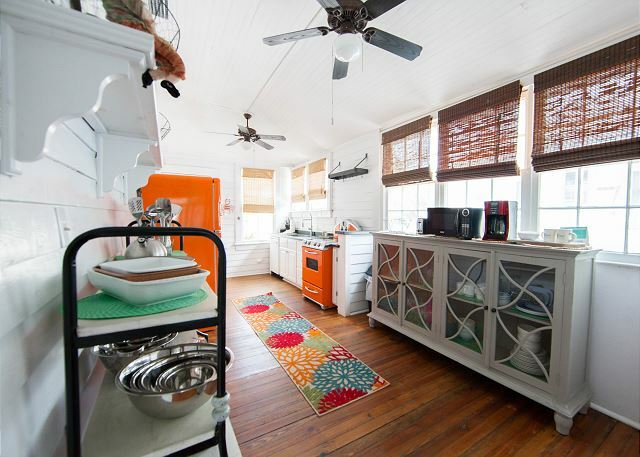 You'll enjoy being here, whether you're making sandwiches or a low country boil! Yes, please. When you walk into Eisenhower's you'll come into the kitchen, here. The living room is to the right, and the back steps are straight in front of you. 4 bedrooms and 2 bathrooms are down the hall. Kitchen, looking back towards the front door. Dining and living room. Off the kitchen. Living and dining room. Off the kitchen. Cozy, bright living room. Dining room is in here too so you can spread out and yet spend family time together. Simple yet amazing decor. Clean and comfortable. 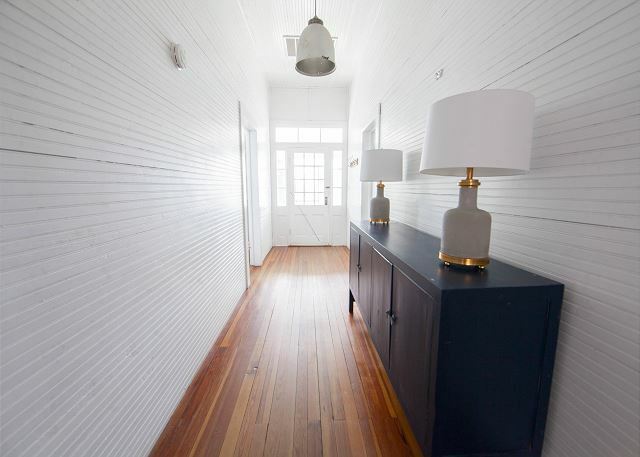 Hallway with gorgeous original heart of pine flooring. Bedrooms and bathrooms, and the door leads to the back yard. Looking from the back door towards the kitchen. 2 full beds in the first bedroom. 2 Full/double beds in this room! Queen bed bedroom. Clean living right here! 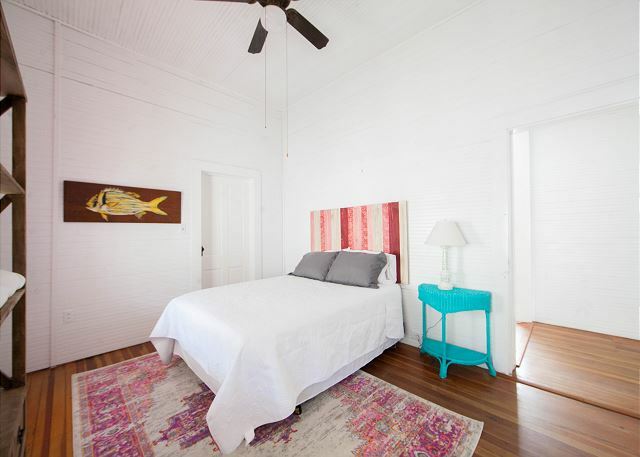 We love the open brightness and tall original ceilings in this home. Tall ceilings allowed for the homes to stay cool in summer. Queen bed bedroom. The modern touches only emphasize the vintage feel of this gorgeous home. Shared bathroom ~ vintage tub/shower combo. Beautiful vintage clawfoot tub. You can pretend you're back in time. King bed bedroom. Lovely tall ceilings and large windows. The modern touches make this vintage home so elegant. Bathroom number 2. Vintage tub/shower combo. 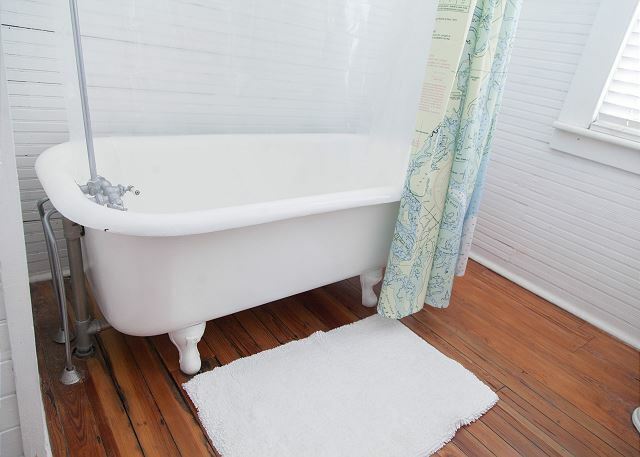 Love the original heart of pine flooring under this amazing vintage clawfoot tub. (There is a shower, too). Bathroom next to king bedroom. 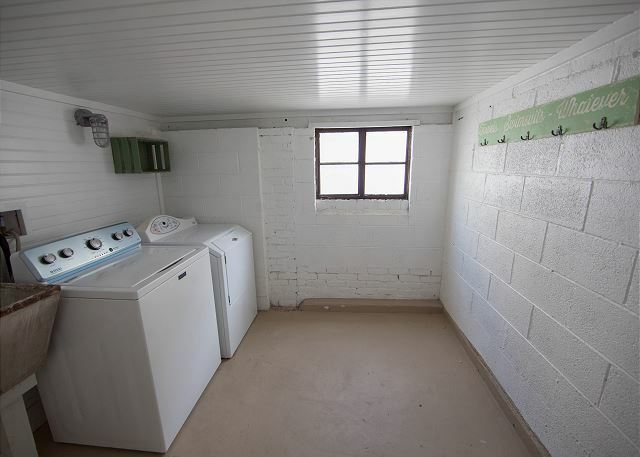 Downstairs full-sized washer/dryer. There is also a beach shower with hot and cold water here. Come take a peek! See You Soon! Leave the worries of your daily life behind and come check in and enjoy the all-new Eisenhower's Retreat! 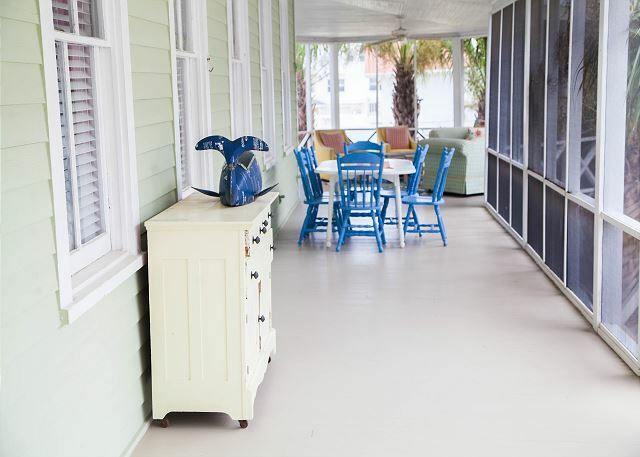 Our nostalgic Tybee island beach cottage is located only a few steps from the serenity of the Atlantic Ocean, the timeless elegance, simplicity & warmth of our home will create lifelong memories for your family for many years. History:Built in 1896 for James Montgomery Dixon & is listed on the list of National Historic Houses by the Department of the Interior (Property ID 11186). 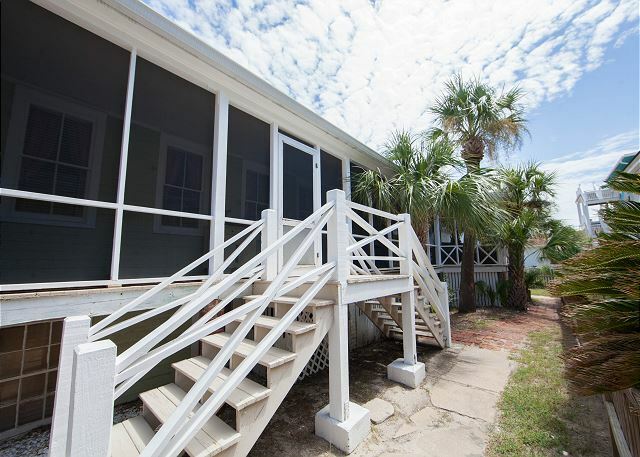 The home is part of a row of summer cottages that make up the Historic Tybee Strand District which developed as a result of the construction of the Savannah-Tybee Railroad in 1887 & the construction of Hotel Tybee on the south end of the island in 1891. Dixon Station, a flag stop of the Central of Georgia Railroad located on the corner of Butler Avenue & 13th Street, was named after Mr. Dixon who served as long time Tybee mayor during much of the early 20th century. 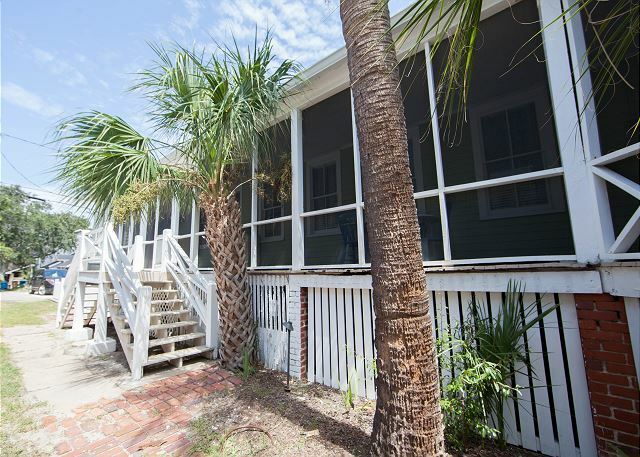 In 1947, Gen. Dwight D. Eisenhower stayed with his old military friend, then Tybee Mayor, at the Dixon Cottage while attending the International Monetary Conference being held in Savannah. 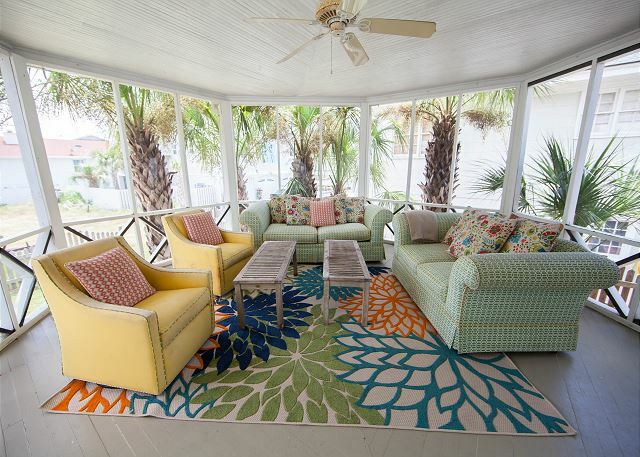 House Description: Warm summer breezes await! Step back in time & vacation like previous generations have done. 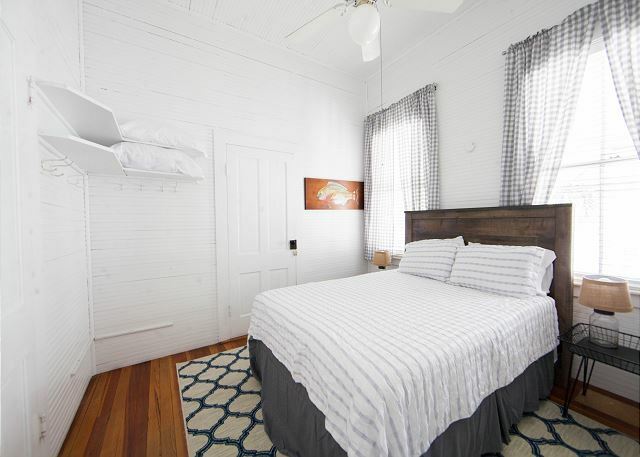 Kick off your flip flops & feel the gently worn heart pine floors under your feet, enjoy a bubble bath in an oversized antique claw foot tub, choose a recipe from our vintage cook books or play an-old fashioned board game. What secrets does this house hold? The house features 10 foot ceilings, originally designed to let the heat rise while floor length windows that open onto the porch from the facade rooms provided cross ventilation. While tin roof & a large wrap around porch remain integral to the architectural features of the house, modern vacationers appreciate the central air after a day in the hot sun. Owners maintain that the original kitchen was located in basement of building & dinner was served with the assistance of a dumb waiter to dining room above. The fireplace still stands but has an electric fireplace for you. There is a private outdoor shower on the ground level. NOTE: This shower/bath area IS NOT ACCESSIBLE from inside main floor. Must go outside & downstairs to use this bathroom. 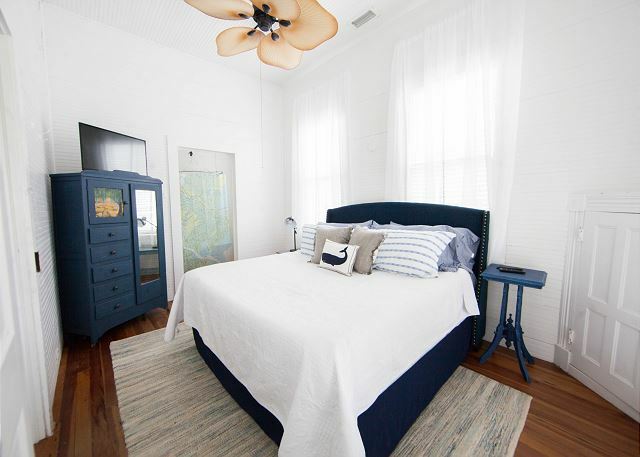 Two full bathrooms located in main house.The 2000 SF home underwent total renovation & features modern amenities with central air/heat, a recently renovated kitchen with new, vintage-inspired appliances. 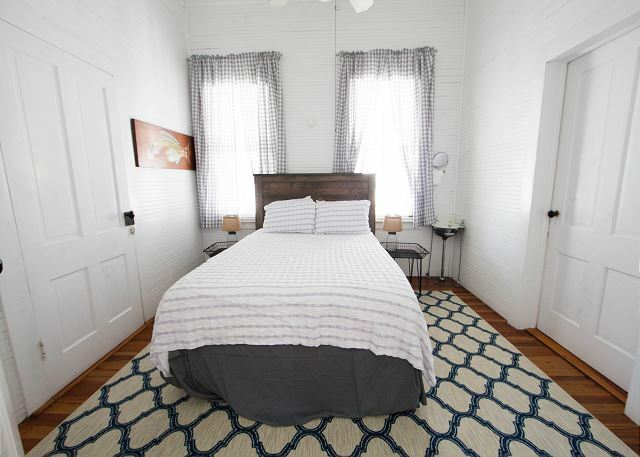 Four bedrooms with original wainscoting & original hardwood flooring. Master bedroom with king bed, 2 bedrooms with queen bed & another bedroom with 2 double beds. 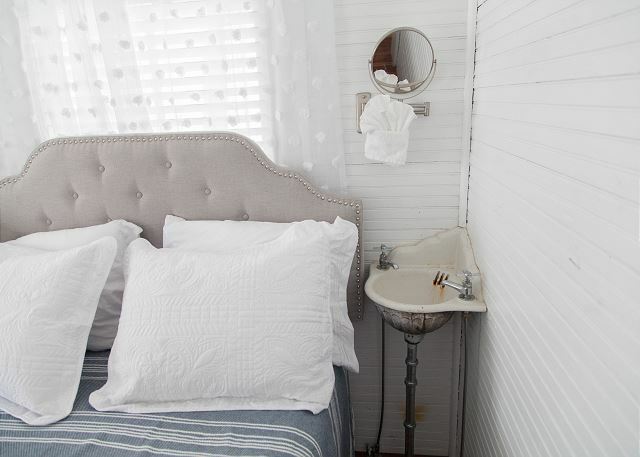 Small cast iron corner sinks in each of the guest rooms were unique to the cottage & have been painstakingly replaced by the owner. 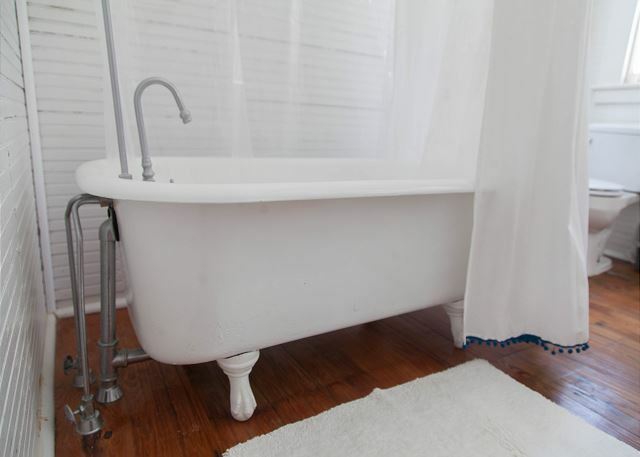 Two full baths feature large claw foot tubs & oversized, vintage shower heads. We ask that you respect our home's aging structure & embrace its quirks! Location: Beach side of Butler Ave. Dedicated parking for 3 cars. Outdoor shower. Walk to the beach on a private beach path without the worry of having to cross any streets. 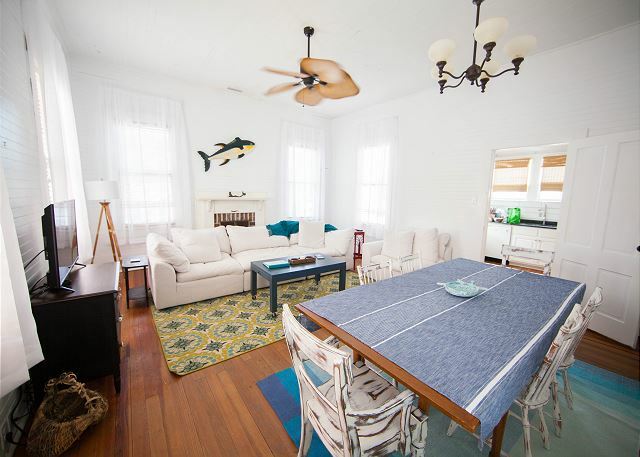 Perfectly situated on 13th street;an easy stroll to Tybee's 'down town' shops & restaurants, the Tybee Island Pier & Pavilion, & the Tybee Island Marine & Science Center. • Cook an old- fashioned meal! • Watch an old movie! • Choose not to drive your car! New electric fireplace for cozy winter stays!! Please note: Longer minimum stay requirements of up to 7 nights will apply during certain times of the year including holidays and summer. We arrived at our rental and were pleasantly surprised. The rental was very cute and clean. Great place to stay for a large group. We loved the location as we could walk to everything. Just a short drive into Savannah. The rental company stayed in touch by email at all times. My friends and I are planning another visit to same house. My family enjoyed the home so much. It was the first time we stayed in a house at the beach, and we will do this from now on. The house was clean and inviting. We walked to many of the restaurants and the beach. We even made good use of the porch when it rained one day. The cottage was a great backdrop for a great vacation. It was clean and very charming. We loved every minute of our stay there. Even with one day of rain, the house was very accommodating for all of us. Our only negative issue was that my husband is 6 months out from hip surgery and the bathtubs and shower were very difficult to get in and out. There is nothing on this property to assist anyone with physical problems in the bath area and the shower downstairs was not clean at all. We had a delghtful time at Eisenhower Retreat. We especially enjoyed cooking a gourmet dinner. Vintage charm, clean and comfortable. Great location. We walked everywhere. Could use a few more living room chairs. Easy access; although an older home, the property was extremely well-maintained. Access to beach is about a block's walk to the dunes. The 10-13 foot tide exposes miles of "new" beach at low tide--walk south to see the jetty and enjoy the sea life that is exposed at low tide. Water temps were high 80s. Walkable restaurants excellent. Overall a wonderful vacation. 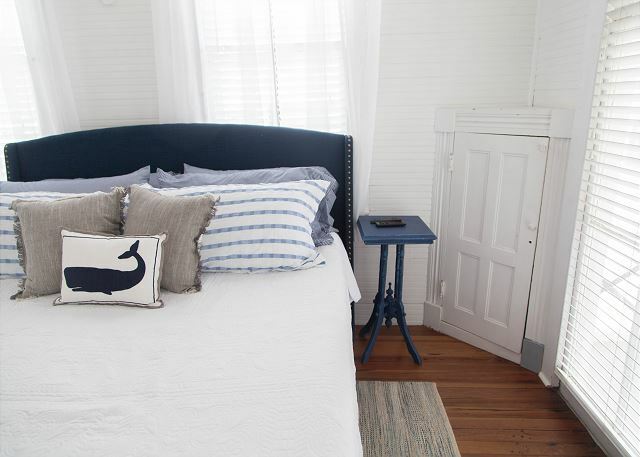 A great historic beach house with beautiful décor. 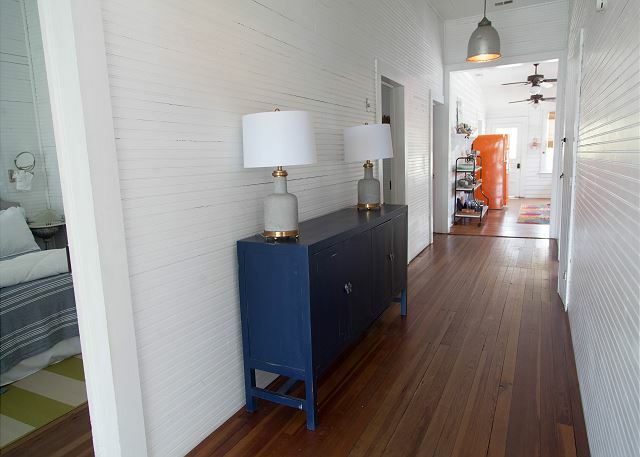 The center hallway, with its shiplapped walls, high ceiling and old wide pine floors, welcomed us immediately. The rooms were so clean and comfortable. Butler Ave, with its restaurants and shops, was a few steps from the house, and the beach was a few steps the other way. 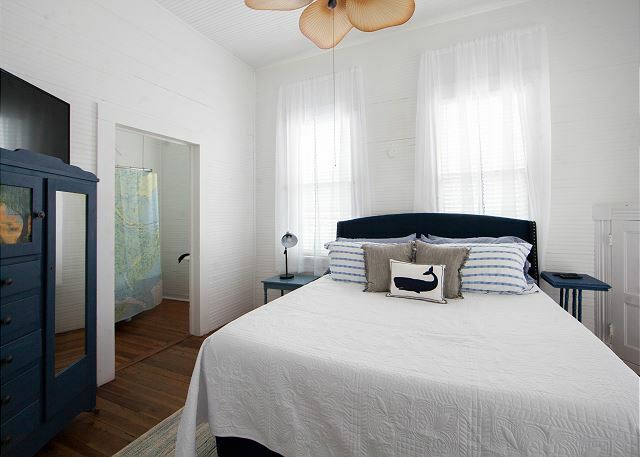 This was our second stay on Tybee Island, and both times we stayed at a Mermaid Cottage and loved it! We loved this home! We had three couples total with three small babies. It's very close to the beach, although there is no beach view from the home. 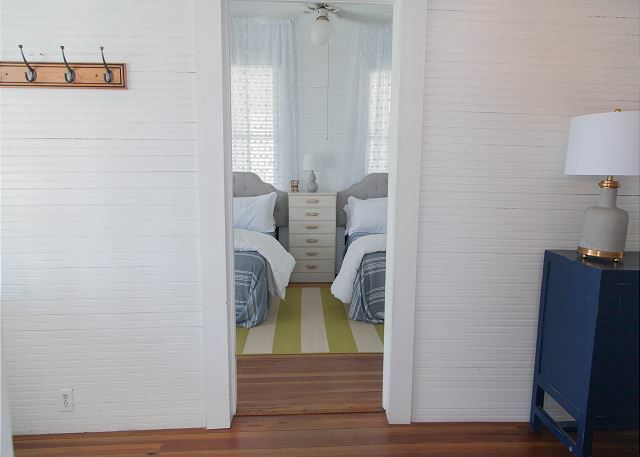 The cottage is very charming - the rooms are actually pretty spacious, the hallway is wide, and the wrap around screen porch makes spending time outside very easy. Something to keep in mind however, is that because of the age of the home, you can hear everything throughout the house. If someone is out on the porch, you can easily hear the talking from the bedrooms. We used sound machines at night to help the little ones sleep, so be sure to bring these if you'll have babies in the home! The location of the home is really ideal - within walking distance to a few restaurants and a quick drive to groceries. Also keep in mind the driveway getting to the home is extremely narrow for trucks/SUV's.. it's workable but drive slow! Great experience! So glad you enjoyed your retreat at Eisenhower's Retreat!!! 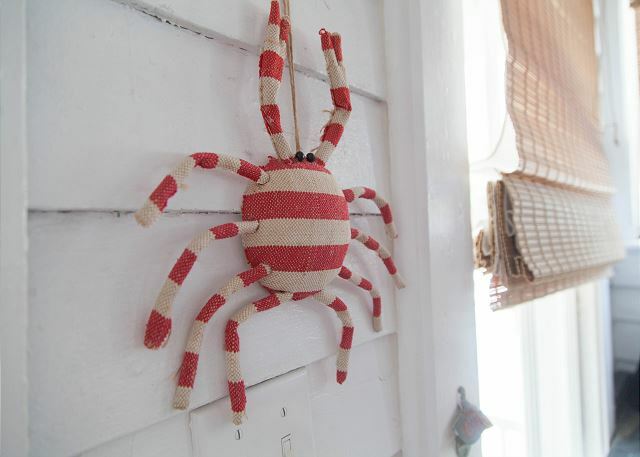 Yes, we love our quirky historic beach cottages but they do have their little quirks like the sound. Most of them were built for being outside during the bussiness of the daytime and inside during the quietness of the nighttimes. It is such an adorable house! Love the porch myself! Come see us again soon!.....the Mermaids! I stayed here with my husband our four little kids (1-6yo) plus my parents (65ish yo). There was plenty of room for everyone to sleep and to hang out. The beds were comfortable. We used Tim's Beach Gear to rent a pack n play and a crib. Also bikes, beach chairs, beach cart, and beach umbrella. All the items were waiting for us, when we got there. The crib was even set up for us already. Highly recommend Tims for any baby and beach gear rental needs. The kitchen was well-equipped with all the dishes and pots and pans for cooking. It would have been nice to have some containers for leftovers, and some pantry staples like oil for cooking. But the IGA grocery store is a short walk away. One other thing is it would have been nice to have beach towels provided. But they did tell us ahead of time so we knew to prepare. The house is really close to the beach, 5 minutes tops to the water (or 15 minutes with kids in tow :)). Wear your shoes, those burrs are nasty. There was a Green Egg for grilling. Jan was available and prompt when we needed some bulbs replaced. She would have helped with anything else, but we didn't need anything else. The place was great and we had so much fun. I wish we could have stayed longer! We went on a Mother Daughter Trip for Spring Break and stayed at the Eisenhower Retreat. 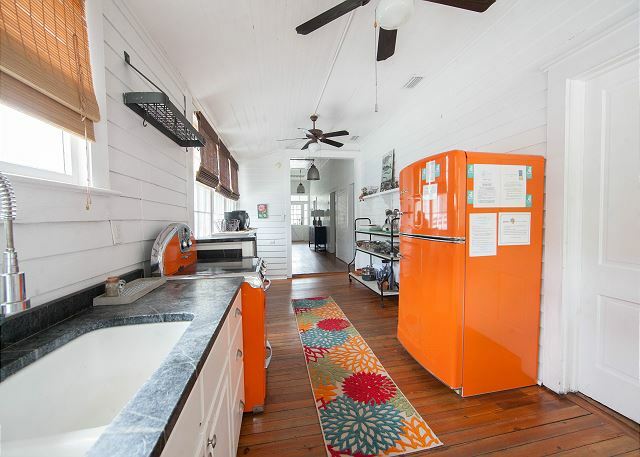 We fell in LOVE with this cottage. So much history and charm but also with modern amenities. We especially loved the kitchen and porch. 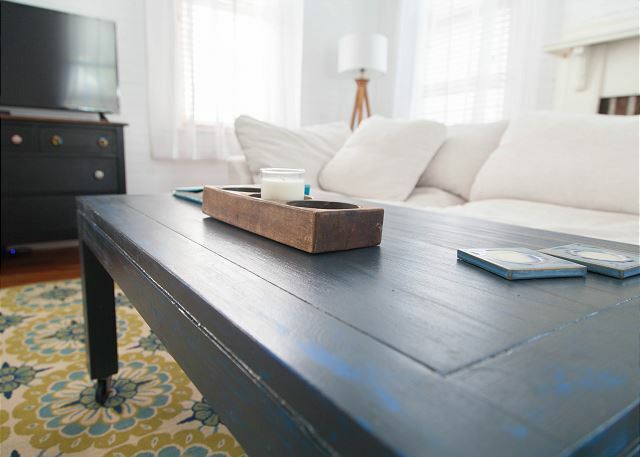 The cottage was clean and comfortable and the rental management was very responsive. FYI...this is a shotgun style house. All bedrooms have connecting doors except for master. We stayed at the Eisenhower's Retreat March 31-April 2nd. The weather was perfect and warm in the low 80's. Water was cool and refreshing and the house was gorgeous! 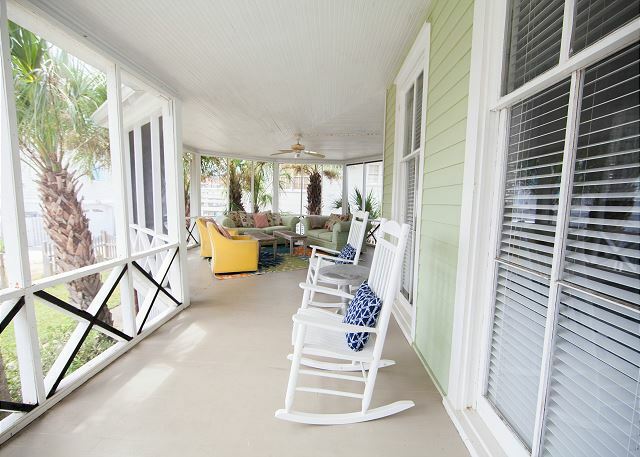 We spent most of our time on the beautiful screened in porch feeling the cool breeze and loved the two minute walk to the beach. Homeowners have spent time making this more then a rental. I look forward to renting out this house again! My mom and I had an amazing weekend off season experience at Tybee Island. This cottage in particular was so charming, and perfect for our stay (although 4 other people could have joined us and we would still have plenty of room!) I loved how close it was to the beach, and how quick the drive was to Downtown Savannah. Plus the history of this house was super cool! Perfect Memories made at the Eisenhower House! We choose the Eisenhower House for our girlfriend reunion celebration of women of a certain age! We found this lovely home to be spacious, nicely decorated and well stocked. The wrap around porch secluded in palms provided us with ample outdoor space to gather for food, beverages and conversation. 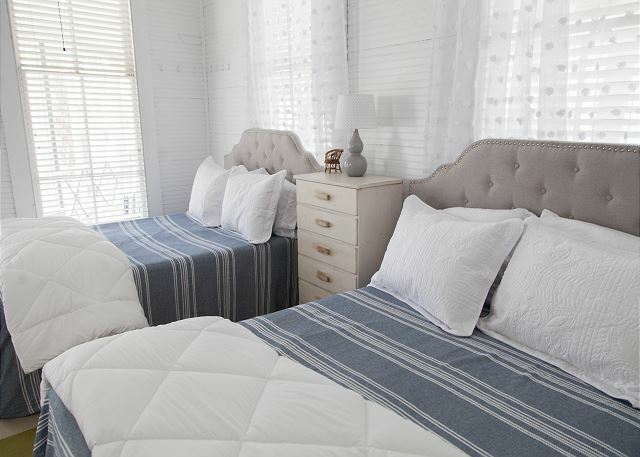 We appreciated to be within a short walking distance to the beach, restaurants, and shops. One concern was for a property being built in close proximity to the home, but there was no work happening during our stay. The rental staff was cheerful and accommodating. We highly recommend this property! We had an extended family reunion and the cottage offered a great place to convene. The house was clean, as described online and had a wonderful porch that called to us. The beach was easily accessible and Butler Ave restaurants were within walking distance. A few minor problems (missing TV remotes, lightbulb out) were attended to quickly although the Mermaids were not able to resolve the remotes problem. The bed was really comfortable and the linens luxurious. 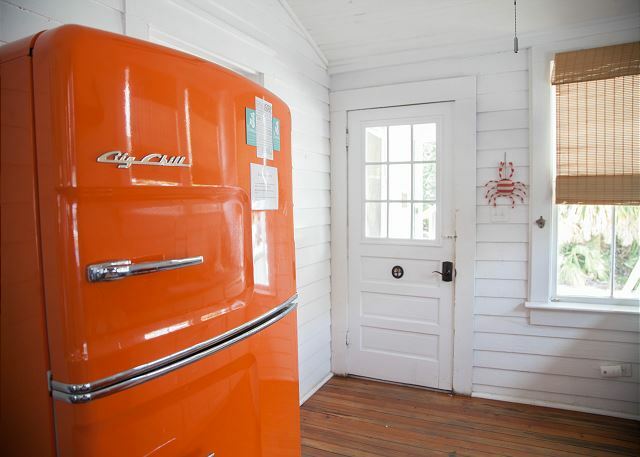 The cottage décor is just precious and we loved the orange fridge. The view of the ocean from the porch which was in an online picture is now blocked by new construction and a porta potty but the location is still very close to the beach for easy toting of all that beach stuff. we had a bit of confusion with the researvation process but the Mermaids did everything they could to make it all work out and to assure that I was satisfied with the experience. It worked! I was very satisfied with their professionalism. We came to Tybee for a wedding and to get some beach time. 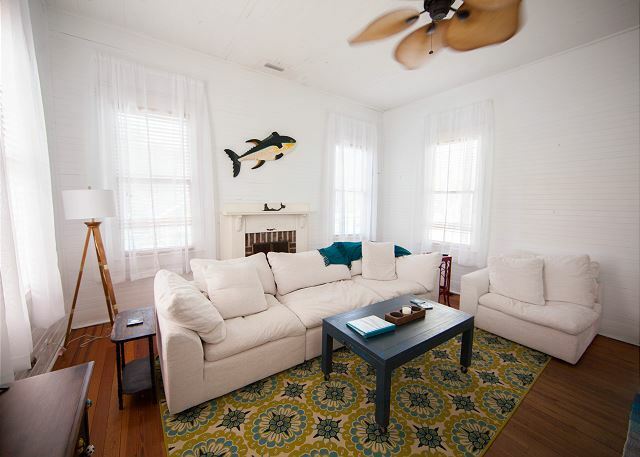 The historic details to the house are well preserved and it's comfortable for large groups. There is plenty of space to spread out if you need a little quiet time. Great place to cook and enjoy the beach. We stayed in Eisenhower"s Retreat for three days in June 2016. We enjoyed our visit. The house is so interesting and well preserved. With four bedrooms we all had out own room which was great. The Mermaid Cottage support staff is also great. There was good contact before the visit and when the air conditioning quit we called and it was fixed by the time we returned from dinner. 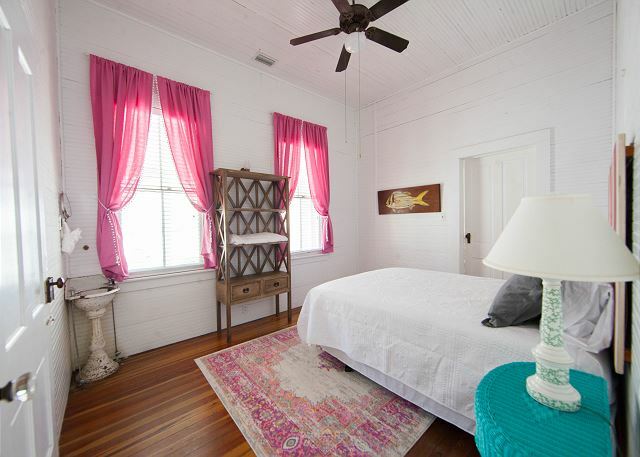 This is the second Mermaid Cottage we have stayed in and will use them in the future. It was walking distance to the beach but you did need instructions to find the path. Once fournd it was easy. Family vacation made better thanks to beautiful home. We spent most of our time on the spacious porch. We hoped the Eisenhower would be close to the pictures on the Mermaid App and we not disappointed. The home was beautiful and immaculate. We are definitely staying here next year and highly recommend it to anyone looking for a peaceful vacation and comfortable accommodations. This was our second stay using Mermaid Cottages. They are an awesome company. The managers are super attentive to your needs and very friendly. The Eisenhower is a fantastic cottage. 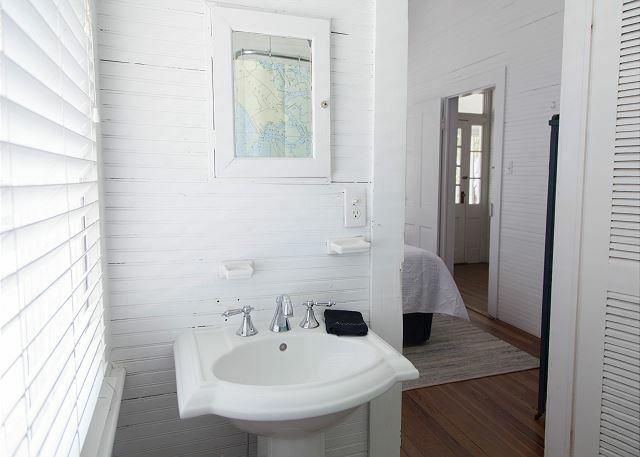 It is a short ways from the beach and the historic nature of the cottage is amazing. 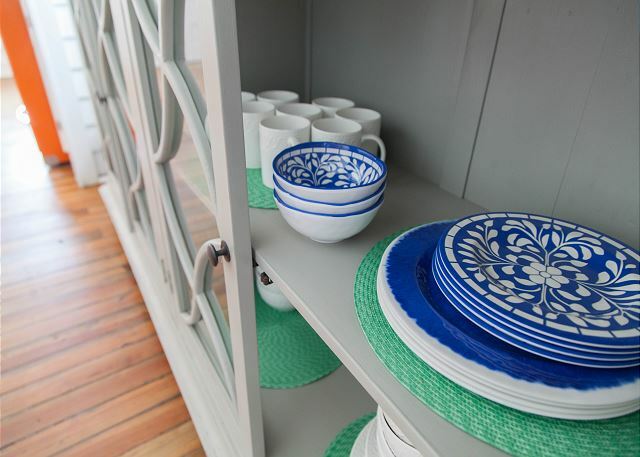 I love how it is decorated with an easy and comfortable style that sticks to its historic roots. The one thing tiny minor thing I would mention about our stay is that it seemed like some of our dishes weren't clean all the way. We had to basically rewash a lot of our dishware. Not a huge deal, especially in the long view of how amazing the whole place really is and how awesome Mermaid Cottages are. Highly recommend. We could not have found a better place for family memories. The Eisenhower Retreat was just perfect for our family. There was 6 adults and 4 children and we had plenty of room and location to beach was perfect. The management of Mermaid cottage was so friendly and helpful, they made sure our family time was perfect for us. 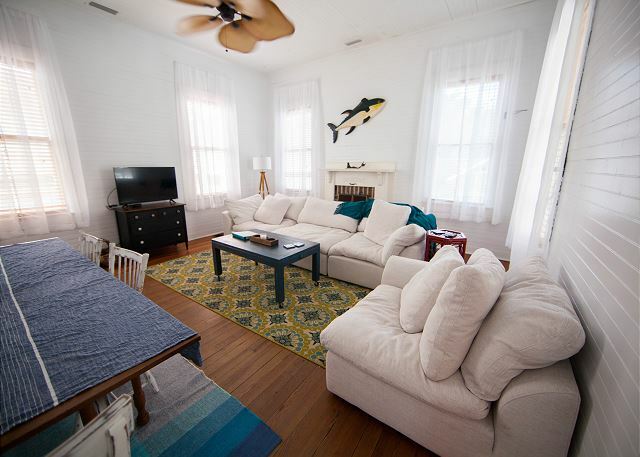 Would recommend this property and Mermaid Cottage to anyone looking for a great family vacation! Wonderful Stay in the Eisenhower! A beautiful, historic home by the sea! The perfect setting for a very memorable weekend! We were sad to leave! But will definitely come back for more! We had a wonderful experience with Mermaid Jan who helped with all of our questions before our arrival. The house was awesome and there was plenty of room for all of us to enjoy each other and still find some private space of our own. Walk to the beach was not too far, but certainly would have loved to be right on or closer to the beach. Large porch was where we stayed most of the time and there could be more lighting in that area. Yard did need some attention, but when we called the Mermaids about it Kurt came and spent hours cleaning up all the outside area around the house. It looked perfect when he finished 5 hours later. 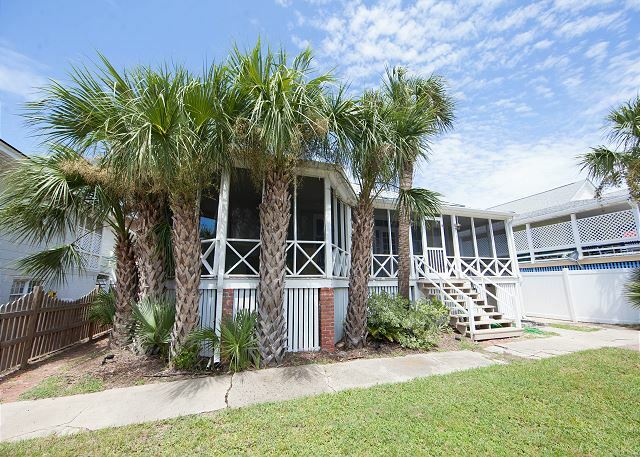 House was clean and located close to grocery store, pier (ice cream) and restaurants. Our experience was nothing but pleasant. The Mermaid Cottages staff was very accommodating when I had already booked our stay, but had to change the initial dates after the transaction was already complete. They made it very easy. The house was very charming (I don't think the pictures do it justice), clean and comfortable. We spent a lot of time on the spacious and attractive porch, just relaxing. The house had everything we needed to cook our meals (when we didn't dine out). The beach was just a short walk away, and we went often. We would definitely come back to Eisenhower's Retreat! We had a fantastic time at Eisenhour's Retreat on Tybee. 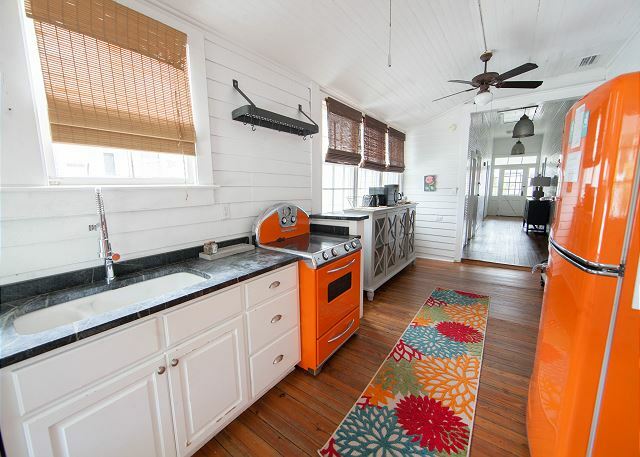 This old cottage was perfect with its claw foot tubs, tall ceilings, ceiling fans in every room, beautiful screened porch and cool kitchen appliances. We brought our two grown children and their significant others and the cottage was perfect for us. My only regret was that it was not beach front, like it was about 100 years ago! Living room Furniture is a bit tired. Otherwise this would be an all 5 stay. I fell in love with the house the minute I walked in the door. 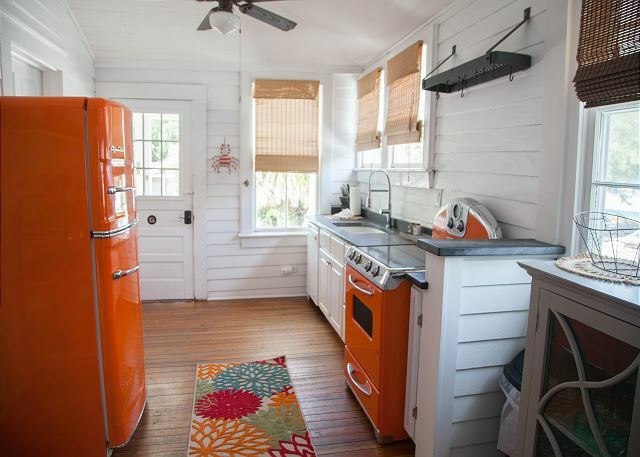 I LOVED the kitchen, especially the orange fridge and stove. The screened in porch was perfect for watching the thunderstorms and relaxing with family. The downstairs space was great for storing beach stuff and the extra room with the air hockey table was fun for our teenagers. Customer service was outstanding and any issues we had were taken care of immediately. Overall, we LOVED our time at the Eisenhower Retreat. It was a good time had by all. There are a couple things requiring attention. As with other past reviews I agree that the lower level drain system needs serious attention. The lower level A/C was not working when we arrived but you Mermaids were prompt in getting it fixed when notified. 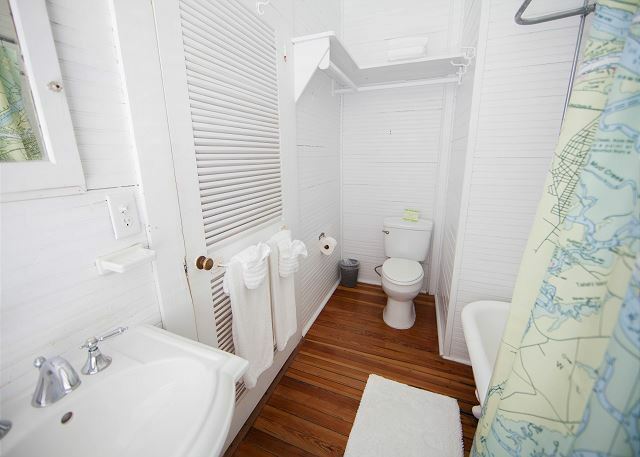 This property should make mention that seniors may have difficulty with the bathtubs - although the description of the cottage should bathrooms should alert them to that situation. Also, the outside needs a bit more grounds maintenance. thank you for your honest feedback. we will add the info about the bathtubs to our description ( great suggestion) as well as look at what needs to be do with the other suggestions. thx you! thank you very much- can you let us know if there is anything more we can do to improve your stay? Eisenhower's Retreat met every expectation and more. Mermaid Cottages does an exceptional job of communicating with their guests and prepping the facility for new arrivals. The location for groceries(and everything else)is ideal. Contrary to what we were led to believe, each bedroom did have private access to the main hallway. This would have been appreciated if our 4th had been able to join us. The air conditioning and ceiling fans did an excellent job throughout the house, though the fan in the hall bathroom wouldn't work. The porch is even more enjoyable and comfortable than we anticipated. The lower level shower still doesn't drain adequately, but the shower itself is excellent. It only lacks an elevated place to put your soap, shampoo, etc. Unfortunately, wee were very disappointed in the restaurants on Tybee. We tried Social first and Cocos second. After that, we ate dinner in Savannah. We would highly recommend The Pink House and Vic's On the River. For brunch we enjoyed Clary's and everyone should have Leopold's Ice Cream. 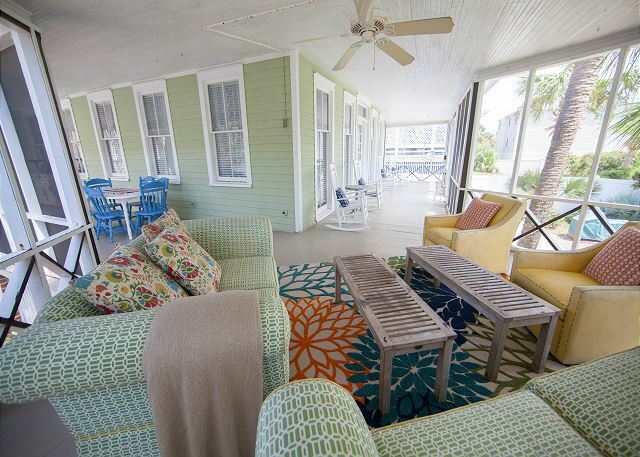 Great location and authentic beach cottage experience. We would rent this property again without hesitation. This house was amazing, we completely fell in love with it. We had a full house with adults, seniors and kids and we all had a great time. 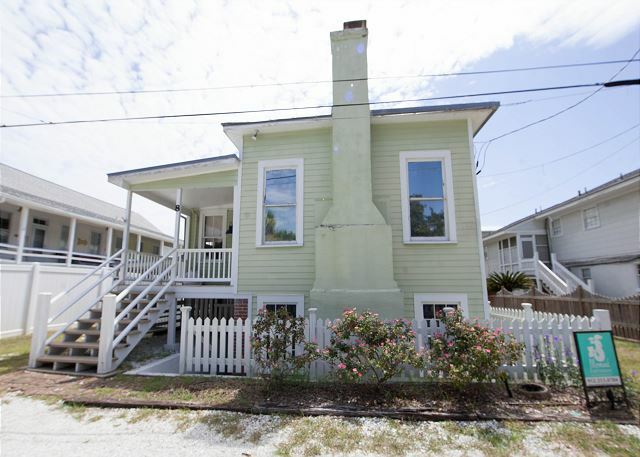 Great location, easy walk to beach, lots of parking room, beautiful porch, cool vintage house. Property management was very reactive to our requests. We went in and out of Savannah with ease, great beach & city vacation. 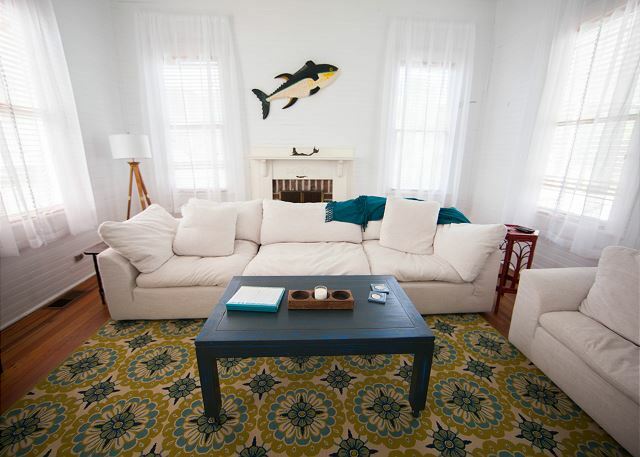 If we come back to Tybee, we'd stay here again just because of the charm of the house. We spent two nights at the Eisenhower Cottage and had a relaxing and fun stay. Everything was easy, we let ourselves in, settled in, went for a beach walk and had a fun dinner at the Tybee Island Social Club, complete with a great band and good food, literally right across the street. Loved everything, just wished we could have stayed longer. Lee E from Atlanta, GA does not recommend this vacation rental. 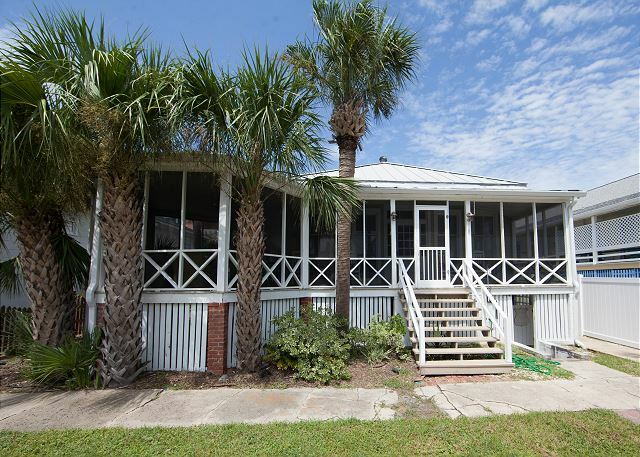 We booked Eisenhower's Retreat because we love Tybee Island. 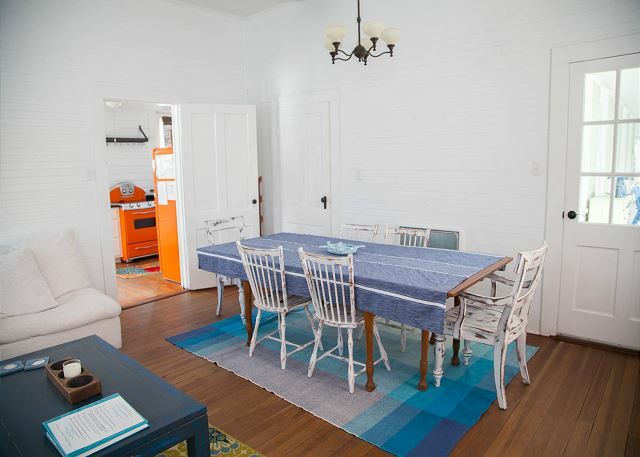 My 80-year-old parents were joining us, and we thought they would love a historic cottage. At the end of our stay, I was taking my son on to college. Disappointingly, our booking agent did not tell us about the huge house under construction next door. The noise, profanity, and safety issues lasted our entire stay. Our view from the very nice back porch was marred by two industrial trash dumpsters a mere 15 feet away -- and full of construction debris. So much for a pleasant sunrise and morning coffee. Our walks to the beach involved dodging nails, wood scraps and plumbing trucks. And on our final night, the roof began leaking and forced me into another bedroom. The downstairs shower was so stopped up it was unusable, and the front of the house remained 20 degrees warmer than the rest of the house. The beach, however, was great as always. Please ask your booking agent to be very specific about your rental home's surroundings and construction activities. We didn't, and they didn't bother to tell us. Nice place. However, the two showers in the basement need to be made functional. It would have been difficult with a large group. The east end of the house was very cold and the west end was warm. Construction noise was annoying. Everything was good. The management team did an excellent job of communicating with us. The 3rd bathroom was downstairs in the basement area. I thought the bathroom should have been assessable from the main level. 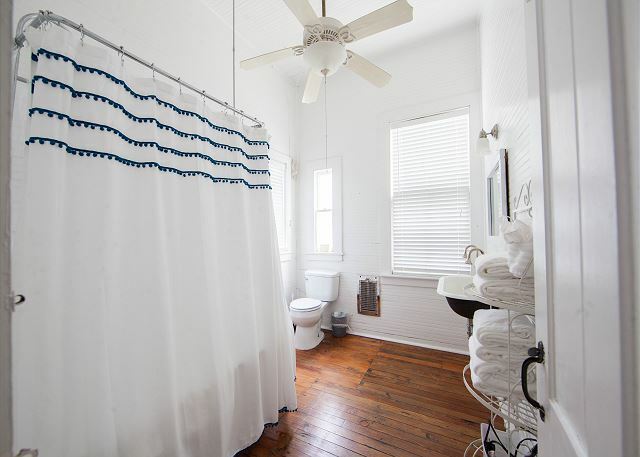 The listing gives the renters the impression that there were three bathrooms on the same level. We made it work. All in all it was a good weekend!!! We absolutely loved the charm and location of this cottage! Only thing that would make it perfect would be for the drainage issue by the basement shower to be resolved. We really appreciated the recommendations for restaurants. Coco's was a great find!!! This house is incredible, especially if you appreciate an older home that has been lovingly restored (but not over-restored!). The beds are super comfortable and we lived on the oversized porch. My teenage kids loved playing air hockey while we relaxed upstairs. The house was nicely cooled with the air on except for the main room, which was exceptionally hot. At times we could not sit in there as it just did not seem to cool down. This might be a problem in the heat of late summer.